The former archbishop compared the struggle for LGBT equality to South Africa's battle to end apartheid. Nobel Peace Prize laureate and South African archbishop emeritus Desmond Tutu said he does not believe religion provides justification for homophobia at a rally hosted by the United Nations Human Rights Office in Cape Town, South Africa, on Friday. 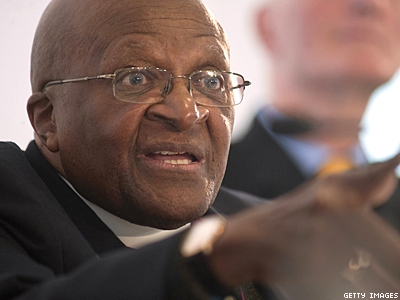 "I would refuse to go to a homophobic heaven," Tutu said, according to Australia's Herald Sun. "No, I would say sorry, I mean I would much rather go to the other place… I would not worship a God who is homophobic and that is how deeply I feel about this." Speaking at a launch rally for the UN's new "Free and Equal" campaign that seeks to raise awareness of antigay violence and discrimination throughout the world, Tutu compared the fight for LGBT equality to the struggle to end apartheid in South Africa. "I am as passionate about this campaign as I ever was about apartheid," said Tutu, an Anglican archbishop who was a prominent force leading to the racist policy's eventual demise. "For me, it is at the same level." Tutu, 81, has long been an outspoken advocate for equality, regardless of race, gender, or sexual orientation. In an interview with The Advocate last year, the peace and social justice advocate said the world maintains "strange images of God." "We don’t seem to understand the image of a God who says, ‘I created you because I loved you,’” Tutu explained in 2012. "God’s dream is to embrace all of us, an embrace we are not allowed to escape out of, including the gay, lesbian, and so-called straight."